Gun cases are small cases that are used to store rifles, shotguns, and handguns. They offer more protection than trigger locks and cable locks. Gun cases are superior because gun cases store weapons in a neat and organized place. 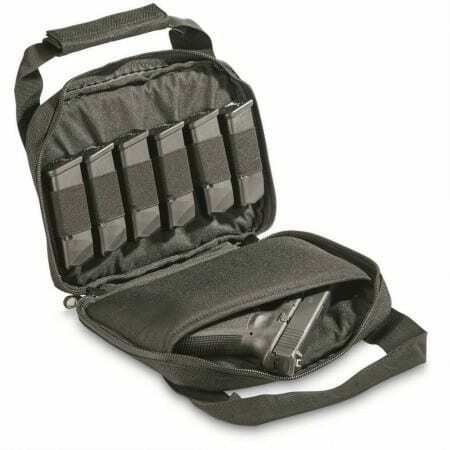 Invest in a gun carrying case if you're serious about protecting your guns. This short review details the top five gun cases are available in today's market. We want to help you find the best case to store your weapons. Safety is the main goal for gun owners, and we'd like to help you achieve that goal. Throughout the review, we'll talk about the pros and cons associated with each product. We've added extra information about certain aspects you should look for when buying a case. By the end of this post, you'll have enough confidence to purchase your first gun safe. Holding a gun requires more than adherence to your local gun laws. You need to have your guns concealed in a safe location all the time. That's why gun cases became so popular in the following years. Choosing the right gun case ensures that your guns remain safe from environmental, physical, or theft issues. Speaking of theft, having a gun safe prevents your firearms from getting into the wrong hands. Burglars break into homes with the intention of stealing and harming everything. Buying the right gun case stops them from using your weapons against you and anyone else. Although innocuous, children are another threat to your firearms. A child can find your handgun and accidentally fire it. You need to keep your weapons out of their reach. If your child accesses your weapons, chances are they'll injure themselves or someone by accident. Being prepared is the few things you can do to stop a robbery. When emergencies (invasions, robberies, etc.) occur, you'll want to have your gun ready for use. Buying a gun safe gives you a selection of weapons to be accessed if an intruder enters your home. Keep these factors in mind when searching for a gun case. Your guns are valuable and dangerous tools that should be accessed only by you. Reading this buying guide increases the chance of you organizing your guns and being prepared for an emergency or a burglary. Gun cases come in two different options. Hard cases consist of sturdy materials such as aluminum, metal, and steel. Sometimes they have tough inner coverings that keep the guns in place. Invest in a hard gun case if you want the maximum protection. Hard gun cases reduce shock damage. Accidents happen. You might ruin the mechanics of your gun if there's no protective covering behind its fall. Since hard cases are made of tough materials, they prevent this issue from occurring. These cases come with warranties in case the exterior becomes damaged or destroyed. Your hard gun case is built to outlast soft cases every time and are needed for long term gun storage. Soft sided cases are for temporary transportation. These cases consist of soft materials such as plastic and nylon. Get a soft sided case if you're a hunter that needs a case that's lightweight and mobile. However, soft cases aren't designed to withstand damage like hard cases. The interior of soft cases provide some protection, but not as good as hard gun cases. Children can access these safes easier than hard cases and cause potential harm to themselves. As we've stated earlier, soft sided cases are useful for temporary transportation only. The interior of your gun safe comes with protective padding. 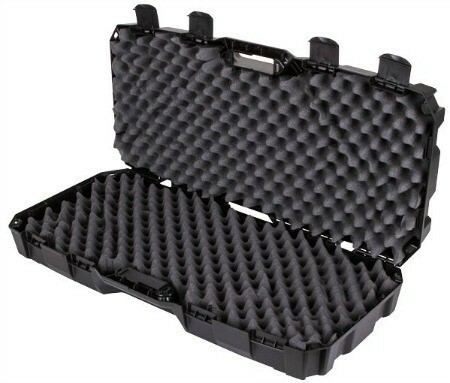 Foam for gun cases consists of foam and protects your arms from becoming damaged. Sometimes, your safe allows you to cut out the foam pieces to your liking. Plan what you're going to store before you remove the foam pieces. If done correctly, you'll save more than just a single handgun and a magazine. Find the accessories and weapons you want to store, and cut the interior foam padding until they are all stored. You'll also want to pay attention to the size of your gun case. Gun cases come in different shapes and sizes and can store one or multiple firearms. Before buying, measure each of your guns to find their dimensions. Large gun cases store up to 16 guns at a time. These are expensive, but they maximize your security. Expect to pay around $200+ to obtain one. For gun owners with an extensive collection, these cases keep you organized and save you money. But what if you have a single hand gun in your possession? There are gun safes that can accommodate for it! We suggest looking at the MTM Handgun Case if you're in need of a simple safe. The case is about $12, making it a great investment for those on a budget. Now that we've introduced you to gun cases, we are ready to conduct our review. Read the review to get a clear look at how each product works. Then, check to see which features suit you the most. Your gun case is an important investment, and we hope this review helps you make the right one. First, the Plano Gun case is the simplest way to store your firearms. It consists of one case that's used to store up to one rifle. You'll need this case if you have a small gun collection and would like to keep it in good condition. We like this product because of its space efficiency. The gun case is broad enough to fit a 42-inch AR-Rifle. But, there's a small component where you can store your clips. Get this case if you want to keep your assault rifle safely tucked under your bed for the next emergency. The Dri-Loc seal is another feature that consumers love. When in effect, the seal prevents dust and moisture from getting on the weapon. Thus, keeping your firearms safe from misuse or other consumers like this case because it prevents their weapons from becoming stolen, or destroyed by natural causes. You need a gun case that's useful when out traveling. The Plano Gun case comes with lockable latches and a pressure valve. These features make your weapon impact resistant and are used to protect your equipment from unnecessary scratches and bumps. Give this TSA approved gun case a look if you can't travel with your weapons left at home. Plus, we like the product because of its stability. Consumers reported that the safe's hinges didn't fall and are covered in one area to prevent from getting hammered out. This allows your weapons to transport safely and without accidentally opening. Another thing we've noticed is the protective inner foam. This foam offers enough protective padding to keep your weapons from falling out of the case. Also, it keeps your firearms in a locked position, so they won't get cluttered when they are not in use. But, there have been some consumer complaints associated with this case. Some users found their case already pre-damaged after buying it. Inspect your case, and send it back for a replacement if this problem arises. You need a gun case that can get the job done. That's where the Plano Gun Case steps in. It's small, yet affordable, and can be found on Amazon. 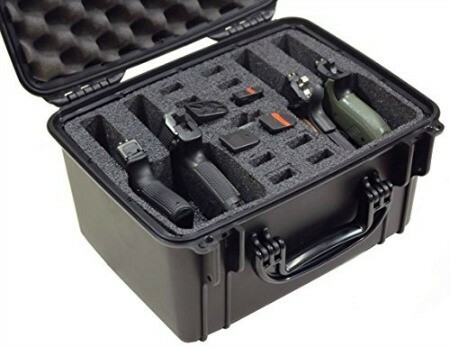 Buy this case today if you're serious about keeping your guns stored for the next event. Next up is the Flambeau Gun Case. The case consists of four magazine pockets that are used to store ammo. And, its materials pass through most TSA regulations. If you want a gun case that can pass through airline security and good for traveling, the Flambeau Gun Case might be for you. One feature that consumers like about﻿ this c﻿ase is its polypropylene construction. Polypropylene is a thermoplastic polymer that's used on multiple occasions. Because of this, the safe's hinges are durable and are resistant from striking. You'll like this case if you want to keep your weapons in tact after usage. The integral handle comes designed for transport. This gives the user the ability to take their hard case in public areas such as airlines, shooting ranges, and other events where an AR is legal. Users like the handle because of its comfortable and helps them when transporting their guns over long distances. Consumers love the clean and rugged appearance. The exterior has a strong base, that is resistant from impacts and falls. Inside, the gun case has four magazine pockets and shot latches. This makes it easier for you to store your weapons and accessories and keep them organized. And, we noticed the durable straps that come with the case. The straps allow for the user to mount their weapon without the fear of it falling out and becoming damaged. Users like this feature because it keeps their weapons aligned and in position when in storage. We like the customization options this case offers. For instance, users can cut the gun case foam into their desired sections. 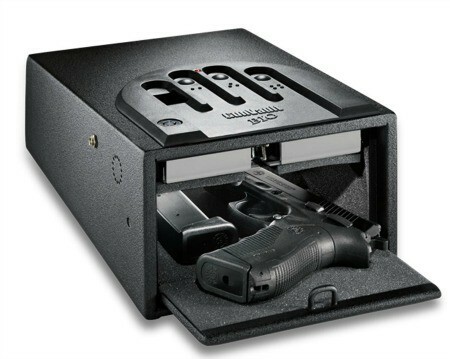 This is great for users who want to store their handguns in a safe and secure area. Get this case if you need something that can be adjusted to fit multiple weapons at one time. Consumers found fault with the device's limited strap mounting options. Shoppers wished the case could have extra straps placed upwards so the magazine could stay on the assault rifle. If this is a problem for you, either put the magazine closer to the rifle or get a different gun case. We believe that the Flambeau Gun Case is amazing for outdoor hunting and traveling. It's available on Amazon. Buy this case today if you need something strong enough to last and provides maximum security for your weapons. Next on our review is the NcStar Case. The case is the perfect mixture of PVC and nylon. First-time users like the cabinet because of its mobility and durability. You should give this case a look if you are planning to take a rifle with you on your next hunting trip. The interior padding is a feature that consumers experience when using the case. For instance, it's made of a soft cotton material that keeps your firearms in a safe position when traveling. For those who need a reliable soft gun case, this might be the right choice for you. One side of the bag offers pockets for users to store their magazines. On the other side lies a small ID pocket, large enough to store your ID tag. Due to these side pockets, users can keep their ammunition and other important aspects organized in a convenient location. Most soft gun cases come with weak zippers that fall apart after use. However, that's not true for the NcStar Case. The NcStar case has two pull-tags with locking rings on them. This means that you can lock the bag and keep your weapons safely shut. Since the zippers are double stitched, they are more durable and stronger than cheaper gun cases. The gun case is lightweight, making it easy for hunters to take with them. It has a carrying capacity of up to 30 lbs. The protective padding makes it easy to wrap around the user's arm or back. Get this gun case if you need something that's light on the body while out traveling. Here's some advice before buying. Make sure that your case is 2 inches larger than the gun you're trying to store. This gives your weapon the perfect amount of space it needs to be stored correctly. 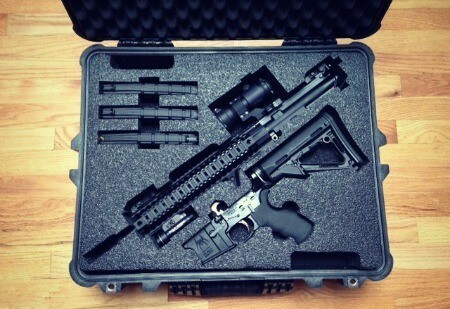 Doing this ensures that your case can store your firearms without it falling or breaking through the material. But there are a few design issues consumers found with the case. For example, there is one flap for multiple side pockets. This results in the magazines and accessories becoming misplaced or in the wrong pocket. We suggest having one accessory and using it for the side pockets. 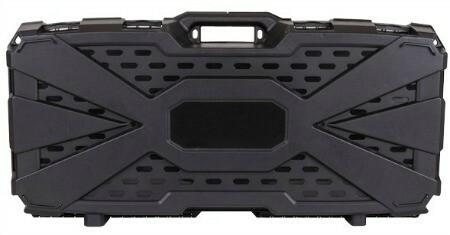 Overall, the NcStar case is the best soft gun case that's available. 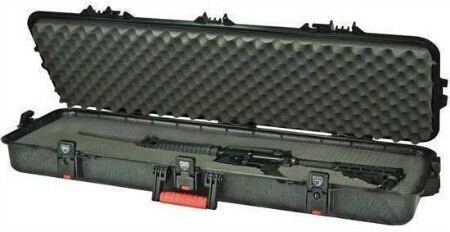 The case allows for your Assault Rifles and ammunition to be stored in a safe place. You can find this gun case on Amazon. It doesn't matter if you have a rifle or a small handgun, your firearms need a location to be stored. That's where the MTM handgun case comes in. Crafted in a polypropylene finish, the case is guaranteed to keep your weapons in great condition for the next emergency or event. The MTM Handgun case comes with hangers to help mount the case. Users can hang their case in the closet and keep their weapons out of harm's reach, especially if you have children in your home. Buy this case if you want something to keep your handguns away from burglars, children, and other intruders. MTM's case comes with double foam padding on both sides. While its original padding can be removed for customization, it won't fall off while traveling. This is ideal for basic gun owners who need a place to store their handguns subtly and efficiently. What's interesting is the amount of space the product provides. The case has enough room to fit up to two handguns and three magazines at the same time. It's a great case for people who want to take their small firearms to a local gun range. The case's durability is another feature that's worth mentioning. Users reported dropping the case from high altitudes and their guns remaining in good condition. The MTM handgun case is a great investment if you need a reliable, shock-resistant case. 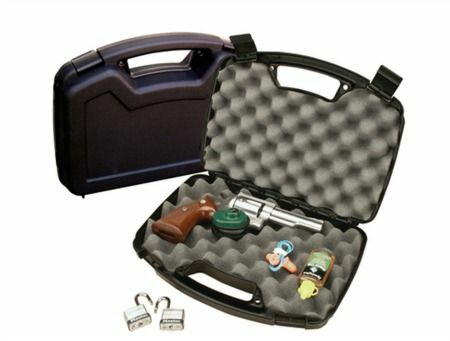 You'll like this gun case if you need something that's compact. It small enough to be carried in one hand in public areas. Because of its small size, you can keep the case inside your car without any issues. Obtain this safe if you need to store your weapons, and is light enough to be used for dangerous situations. We suggest getting an extra lock for this gun case. If an invasion were to occur, burglars could break through the padlock tabs with little effort. Invest in additional security methods if you plan on buying this gun safe. You can't go wrong with the MTM Handgun Case. The case has enough space to keep your guns safe. It's the cheapest safe on our list at a price of $12. Buy it today to ensure that your pistols are ready to use to fight off attackers and protect you and your family. Last on our list is the Case Club Pistol Case. The case is accepted by most commercial airlines and is good for simple transportation. If you're serious about protecting your livelihood, then this pistol case will do the trick. Case Club designed this case to be waterproof. This means you can travel with the case without your guns becoming infected with moisture. Moisture reduces the quality and effectiveness of your firearms and causes it to jam. Fortunately, you can use this case without the fear of your guns being damaged. In fact, the case comes with an additional moisture removal tool. The tool is scrubbed on the sides of the handgun to prevent moisture from slipping in. 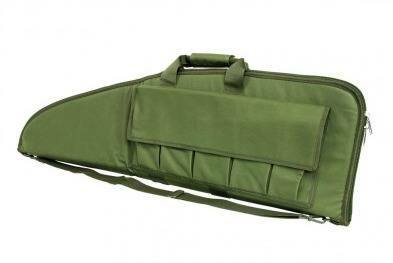 Purchase this gun case if you want the ultimate moisture protection. The case comes with secure snap latches. The latches are pulled open by the user after the safe code registers. Also, it has a padlock feature that ensures that your weapons remain safe. Users like this case since it offers the highest level of protection for their handguns. Case Club offers a lifetime warranty for this gun case. In the event your case is burned or damaged, you're eligible for a refund. Users like to use this case because they last longer than competing safes, and assists you if your safe needs repairs. We do like the bulky feel that the safe offers. Cheaper products destroy their guns due to their lightweight material. With the Case Club Pistol Case, your guns are protected from impacts and drops. You should get this case if you're a homeowner who wants their weapons to stay in good condition. Some consumers had a found fault with this safe's storing capabilities. While it can store pistols, it would be nice if it was accessible for revolvers. You might have to opt for a different case if you have revolvers in your inventory. Still, we believe that the Case Club Pistol case is one of the best locking gun cases available. It keeps your handguns locked and stored in a safe area without destroying its quality. You can find this product on Amazon. The Plano All Weather Tactical Gun Case, 42-inch is the winner. The case allows the user to store their gun under the bed and passes airline regulations. Give this product a look if you want the ultimate gun case for traveling. Do you have any questions using any of these cases? Leave a comment and let us know what you think.